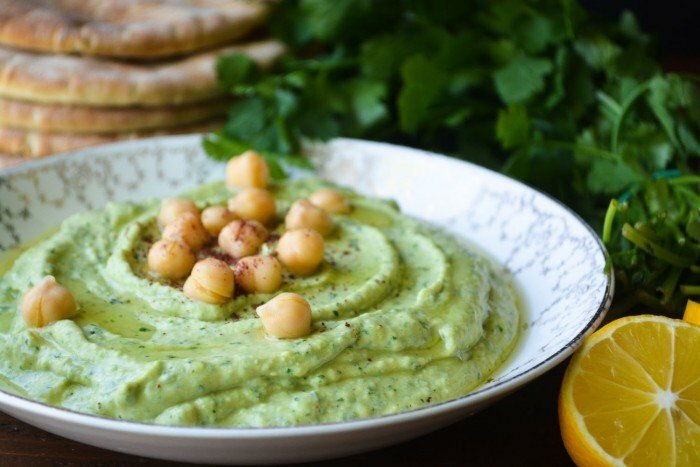 Cilantro Hummus is a fresh vibrant take on one of the healthiest and most versatile appetizers out there. Put the chickpeas and the clove of garlic into the bowl of a food processor fitted with the blade attachment. Turn the machine on and let the chickpeas go for about 5 minutes, stopping the machine and scraping down the sides often. Do not add any liquid at this point, even though the mixture is dry. This step helps insure a very creamy hummus. Just keep scraping down the sides. Add the tahini and lemon juice and process for another minute or so, still scraping down the sides of the machine as necessary. Now process in the cilantro, letting it go until it is well incorporated. Add enough cold water to loosen the hummus to a dippable consistency, approximately 1/4 cup, but you may need more. The hummus will thicken further as it chills in the fridge, so don't be afraid to add that water to loosen it up. Taste to adjust the salt and lemon, and then cover well and refrigerate until ready to serve. Serve with a drizzle of good olive oil, and a sprinkle of sumac or paprika.